Kari Radasch was born and raised in coastal Maine. She received her BFA from the Maine College of Art in Portland, Maine, and her MFA from the University of Nebraska- Lincoln. She has been a NCECA Emerging Artist and demonstrator, a presenter at Arrowmont’s Utilitarian Clay and was the first potter awarded the Evelyn Shapiro Fellowship at The Clay Studio in Philadelphia. 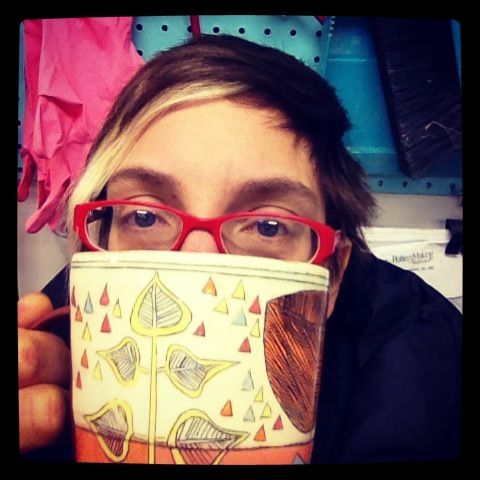 Kari has taught at Bates College, Southern Maine Community College and is currently teaching at Maine College of Art. She has had a wide variety of artistic experiences leading to her current work; potting in Japan, a summer working in the Kohler factory, a Salad Days residency, a studio practice in the Bay area, and the most substantive yet: parenting two young children. She lives and pots in Westbrook, Maine where she resides with her husband Ian Anderson, daughter Ruby May, son Heilo Blue and their dog Max. You can reach Kari at kari@kariradasch.com.